Lejlighed 18 m2, fuldt udstyret, 2 personer. 18 m2 lejlighed tæt på Latinerkvarteret. Første sal gårdhave. Meget rolig. Fuldt renoveret (2013). Komfort. Internettet. WIFI. Velegnet til en eller to personer. Køkken med mikroovn, køleskab, komfur, fade, sengetøj, sengetøj, håndklæder, vaskemaskine tørretumbler, kaffemaskine, TV, radio, bad og separat toilet. My boyfriend and I found the apartment to be perfectly convenient, well-equipped, and super cute. I would mention that it is a small space, so no more than two people should stay at a time. I would totally recommend it though (and in fact already have! ), and would stay again should we be lucky enough to be back in Paris soon. The studio is tiny, but everything that could be done to it has been. So, built in shelves etc. It is in a good location. Because of the size, however, it is not a comfortable place to stay. There is nowhere to sit and relax so one is pretty much limited to sleeping there. It is smaller than most hotel rooms. That said, however, it is very reasonably priced so you get what you pay for. The location was very convenient for us, the area is very nice, with good boulangeries and restaurants close by, and we had Jardin des Plantes, Pantheon and even Notre Dame at walking distance. Good communication by metro too. The apartment is small but just as a big hotel room would be, and it is very well equipped and nicely arranged. The owner was very helpful and we very much enjoyed our stay here!! 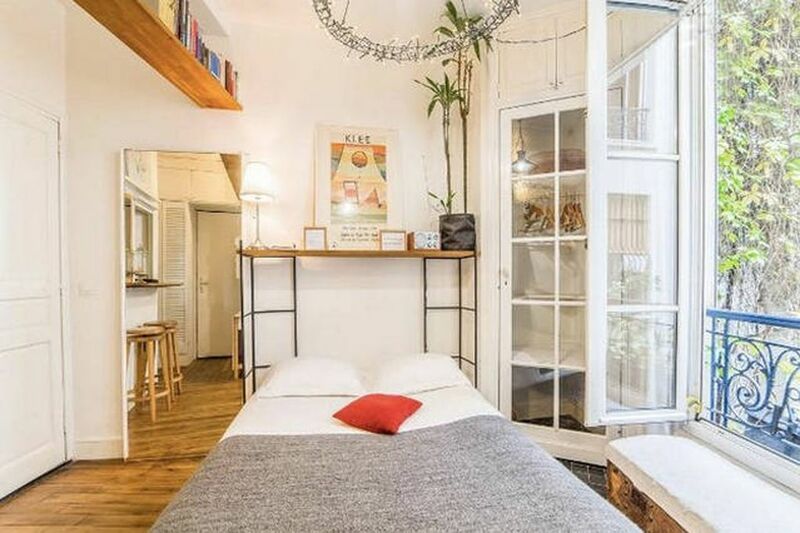 joli studio, bien équipé et bien situé. Un studio très agréable. Lumineux et joliment décoré, il est agréable à vivre. Les photos sont tout à fait conformes à la prestation. Il est de plus très fonctionnel et dispose de nombreuses astuces et équipement. Bien placé entre deux lignes de métro, près de nombreux commerces, il est très bien placé pour rayonner dans Paris. La propriétaire est très sympathique et serviable. En résumé, un séjour très agréable, une location que je recommande. My husband and I stayed here and loved it. It is small, like a studio in American standards. But adorable, clean & functional. Plus the location is great and we felt safe walking home at night. Great bakery below, restaurant across and below. Little market around corner. We walked to most sites but the Metro was pretty easy too. It was just so beautiful walking home. We must have taking 2000 pictures! Diane met us at the apartment and was very helpful. If ever in Paris again we would stay here! Cosy studio, quiet, clean and ideally located. Functional studio, clean and well equipped. Location is ideal, 5 minutes to Goeblins or Glacerie Metro, Bus 21 to Gare St. Lazare across the road. 10 minutes walk to Place d'Italia. Mouffetard 5 minutes walk. Wi-fi access with no interruptions. Honest description. Owner totally charming and accommodating. Great find in Paris, we will stay again and have recommended to family. Der er flere nærliggende supermarkeder, små købmandsforretninger åbner kontinuerligt (24T / 24), restauranter og endda en wienerbrød / bageri ved foden af ​​bygningen. En 10 minutters gang fra lejligheden Rue Mouffetard (meget kommercielle og turisme) giver et marked, mange restauranter af alle typer og specialiteter af alle slags.